It is that time of year again when not only the days grow shorter but so does the fishing report. Most of the DNR’s creel clerks are done for the season and with fewer anglers out it becomes nearly impossible to get updates on conditions around the state. The steelhead runs continue and anglers should find fish from now until freeze up. This is the time of year to target pike, muskie, walleye and perch as the bite increases as the water temperatures drop. Lake Erie: Boat anglers were getting some walleye in Brest Bay when they can get out. Fish were caught in shallower waters when jigging with minnows or plastics. A few shore anglers were targeting fish off the Metro Park. Yellow perch are moving up into the river. Detroit River: Walleye anglers were jigging minnows and plastics around the islands. Yellow perch are just starting to move into the cuts and canals. Lake St. Clair: The ramps are starting to come out however there was still at least one dock in at all the launches at this time. Water temperatures were in the upper 40’s. Muskie fishing will only get better as the water cools down. Target the areas where the rivers are flowing into the lake and where the gizzard shad concentrate. Anglers were trying to get out for yellow perch on the south end of the lake however rain and strong winds have made for tough conditions. Bluegill, pumpkinseed and crappie fishing in the canals and marinas was very good. St. Clair River: Shore anglers casting off the wall in Port Huron caught walleye after dark. A few salmon were caught in the early morning or evening. Saginaw Bay: Had no boat anglers due to the wind and rough conditions. No word on yellow perch in the cuts yet however anglers should start fishing for them as they will be in anytime now. Saginaw River: Is starting to see quite a bit of walleye activity on the lower river from the Veterans’ Bridge downstream to the mouth. A good number of boats were out along with a fair number of shore anglers. DNR staff have reported a fair number of tag returns which suggests the walleyes are there. Overall: Steelhead are still moving into the rivers however the waters were running high and turbid because of the recent rains. Inland lakes are producing bluegills and perch. St. Joseph River: Look for steelhead at the Berrien Springs Dam. Water temperature was near 48 degrees. Fish have been reported all the way up to Niles and Buchanan as well however upstream movement of fish will drop as the water cools. Kalamazoo River: Had reports of steelhead up near the Allegan Dam. Black River: Shore anglers drifting or using spawn on the bottom caught steelhead. Grand Haven: Had no boat or pier anglers due to the windy and rough conditions. Grand River at Grand Rapids: The water level was up but still fishable. Steelhead are being caught up near the dam. Anglers are using a variety including spawn, plugs, thunder sticks, spinners, small spoons or a jig and wax worm. Murray Lake: In Kent County was producing bluegills in 20 to 24 feet. Anglers were using perch rigs with wigglers, red worms and wax worms. Muskegon River: Is producing some nice steelhead especially in the lower river. Catch rates were still spotty but a few more fish were caught after the last rain. Anglers are casting flies, spoons, beads and crank baits. Look for walleye and perch on both Croton and Hardy Ponds. Cheboygan River: Continues to produce steelhead on real or artificial spawn bags. Some were also casting small spoons or crank baits. Alpena: Pier anglers casting body baits caught a couple walleye. A few whitefish were speared in the bay. Thunder Bay River: Those targeting trout and salmon up near the 9th Street Dam had increasing catches of Atlantic salmon along with a couple Chinook. Coho, steelhead and lake-run brown trout. The Atlantic salmon are currently spawning. Fish were taken on spoons and crank baits as well as by those stripping streamers, bottom bouncing or floating spawn bags and flies. A couple walleye were taken by those casting crank baits. A few yellow perch were caught by those still-fishing with minnows and wax worms. Oscoda: Pier anglers caught walleye when casting body baits and jigs. Au Sable River: Good numbers of Atlantic salmon are being observed and the bite picked up a bit for those using streamer flies, egg patterns, casting spoons or spinners, and bottom bouncing or floating spawn bags and beads. Most of the Atlantics are actively spawning. These fish have been picky and change day to day, so anglers should be willing to change their rig or move to find fish willing to bite. A couple steelhead were taken on spawn bags and beads. Most were small, but a few larger fish were caught. Those casting spoons or spinners caught a couple pike or the odd Chinook that was extremely dark and decaying. Walleye were caught down near the mouth when casting jigs. Tawas River: Those fishing the lower river caught walleye. Traverse City: Those fishing in the West Bay were still getting some perch however catch rates were still hit-or-miss. Those lucky enough to find a school of fish caught some up to 14 inches or more with emerald shiners or wigglers. Platte River: Anglers were still getting a few coho when casting small spoons, spinners or crank baits. Frankfort: Pier and shore anglers were getting some steelhead and the odd coho with spawn on the bottom or when casting small spoons. Manistee: When they can get out, pier anglers caught steelhead and whitefish. Manistee River: Boat anglers drifting along the lower river caught a few fish in the deeper holes. Those fishing up near Tippy Dam have caught steelhead on spawn, flies and beads. Ludington: Pier and shore anglers continue to catch some steelhead along with the occasional coho on real and artificial spawn bags. Those surf-casting used spawn bags on the bottom or were casing small spoons and crank baits. Little Bay De Noc: Walleye anglers reported fair action with the better catches for night anglers. Day anglers reported spotty catches throughout the Kipling reefs and south to the Escanaba in 18 to 38 feet with stick baits. Many reported large schools of bait fish throughout the area. Perch anglers reported very little as the waters are starting to turn over and were getting cloudy. Not a lot of smallmouth bass were caught but those found were some very large fish. Most were fishing from Hunters Point south to the Farmers Dock area with plastics or small crank baits in 12 to 20 feet. Water temperatures were hovering around the mid 40’s. Fishing Tip: Will you be targeting steelhead this fall? While many people are preparing to head into the woods for the next several weeks, others are taking advantage of another activity: fall steelhead fishing. There are two great strategies to try when targeting steelhead this month, surf fishing the piers and beaches of the Great Lakes and/or river fishing. If you choose to target the Great Lakes, consider using a slip sinker rig and live bait, such as spawn bags, night crawlers or shiners. You can also try casting small spoons, spinners or body baits with great success. Focus on depths of 12 feet or less as steelhead are hanging in the shallows looking for food. If you choose to target the rivers, consider using wigglers, caddis or wax worms drifted under a slip bobber. The depth below the bobber should be set to present the bait just off the river bottom. Anglers can also be successful this time of year casting spinners and medium diving crank baits into holes or other holding water that provides steelhead with some depth for cover. The retrieve should be as slow as possible to get the lure down to the bottom without snagging up. Many anglers like a downstream cast for these techniques. For anglers looking for an added challenge, they can also use fly fishing techniques and see some great results! 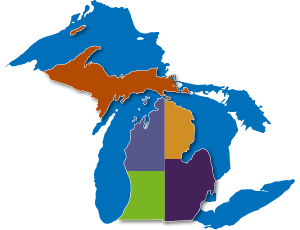 For more information on fishing for steelhead in Michigan, visit their page on the DNR’s website.